(10:25 a.m. EDT) -- Carnival Cruise Line is making your next pizza craving easier to indulge, by adding onboard delivery service to its onboard app. The HubApp, which started as a way for passengers to communicate with each other onboard through their smartphones, has already evolved as a way for people to book spa appointments and shore excursions. 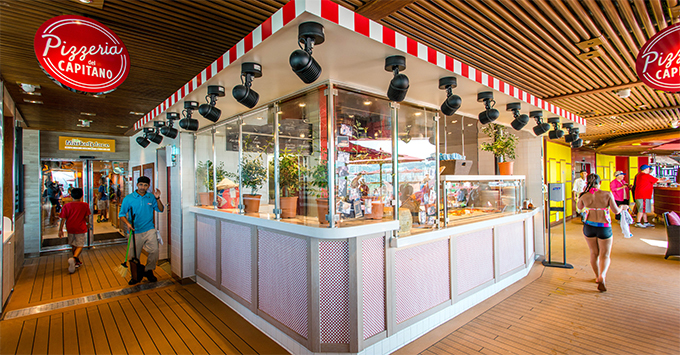 Pizza delivery to different venues of the ships evolved as a natural idea, said Carnival Chief Operations Officer Gus Antorcha. Delivery is currently available on two ships, Carnival Horizon and Carnival Vista, and the line plans to roll it out fleetwide, Antorcha said. The service costs $5, a fee that's imposed primarily to cut down on waste and stop passengers from sending pizzas as a joke. "You'd think it's hard to deliver to the guests," but it's really simple, Antorcha said -- passengers take a photo of themselves at the venue where they're sitting and the crew member looks for them when the pizza is ready. "We've been able to do it within 11 minutes." There are limits as to where pizza delivery will go -- passengers won't be able to order food during a show, for example. Expect more passenger-driven features to come down the line for HubApp, Antorcha said. "Our approach is that we've built this platform, we've built this capability," he said. "If it works and it's a good experience, we'll roll it out."